I’m seeing so many people caught up in arguing and fighting over labels and blame in the aftermath of Robin William’s death that I felt compelled to share a lesson I’ve learned in my life. First off, in case you don’t know; I am a suicide attempt survivor. Actually, I’m a survivor of multiple suicide attempts. I’ve been in and out of more mental hospitals than I’d ever want to admit to. I used to try to answer questions about why, and how did it feel. Others would struggle to comprehend my answers. Many times I would be angered when I heard people call suicide a cowardly or selfish decision. Now, I’m glad when others don’t understand. Because it means they’ve never felt as emotionally low as I have. There is no need to convince them of anything. I simply ask them to appreciate that suicide makes no sense to them. I let them know I’m envious that they can’t grasp these dark sensations. If you’ve never felt so bad that you seriously contemplated ending your life or took actions to do so, you won’t know how it feels. There aren’t enough words, interviews, or media sound bites to get that horrid feeling across to someone who hasn’t experienced it themselves. Good. I want to live in a world where fewer people know those dark feelings and impulses. But we can all allow others to feel however they do without falling to name calling, labeling and blaming. Offer some compassion to those struggling with issues that you are not familiar with. Suicide and depression isn’t a character defect or something someone just decides to turn off/on when they feel like it. It is senseless, not selfish. It is hopeless, not cowardly. When I was suicidal I thought friends and family would be better off without me. Sure, I knew there would be some initial pain, shock and grief, but I believed that over time everyone would be in a better place without gloomy old depressed me around. It did not feel selfish. I had a distorted perception that I was helping others by vanishing. If you can’t fathom, feel, or even empathize with depression, anxiety or any mental illness – it’s OK. Be glad. Celebrate that. But please don’t argue with or put down people doing their best to live with it, or those that can’t manage to live with it. What is the point of arguing over something you know nothing about? When I was 18 years old, I was certain that anyone who said they were happy was lying. I believed that anyone who took an honest look at the world and at their lives would see that life sucked. Often times I tried to convince people that suicide was the only logical thing to do. I was wrong. I am thrilled to have been so wrong. Nobody’s beliefs change by being badgered and argued with. Our perceptions change over time, based on our experiences, based on what works and doesn’t work for us. We can all choose new beliefs, but arguing with someone over their beliefs or yours is a fool’s game. What is more important to you, to be right or to be happy? You can disagree with me. You can mock this post. I don’t care if anyone thinks I’m right, I’d rather be happy. To all my fellow attempt survivors, to everyone ever labeled with a mental illness, I invite you to not try to explain the unexplainable. Do not attempt to convince, justify, or defend actions rooted in pain and hopelessness. That merely drains your time and energy. Instead, be glad that someone else doesn’t know your pain. I understand that this isn’t easy, but give it a try. If you hear someone call Robin Williams a coward, or if you read an article or post saying that anyone who has killed themselves or tried is selfish, don’t try and prove your views are right or change theirs. I encourage you to say to yourself; “They’ve never been there, they don’t get it. Good for them.” And move on. Andy, great article. I also suffer from depression. I am also an Infinite Possibilities believer. Thanks. Thank you for sharing, Linda. Keep believing! Thanks for writing this, Andy. I’ve not suffered from clinical depression, but I’ve certainly sunk low into hopelessness and I don’t judge those who choose to end their suffering. I appreciate your bigness of spirit that allows you to be compassionate to those who cannot be compassionate towards you. My pleasure, Tomar. I’m glad I acted on my inner nudge to write this. Andy, thanks for having the courage and wisdom to share your own story! Appreciate your unique perspective of finding a way to be grateful for not understanding depression, anxiety and mental illness. We are all so very blessed that you are a suicide attempt survivor! Thanks for the kind words, Sheila. They mean a lot to me. 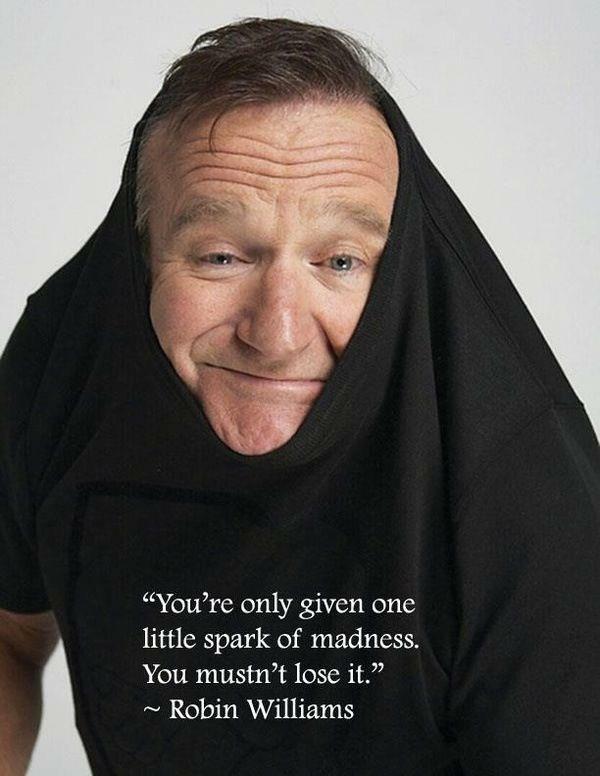 I’ve been thinking about you since Robin’s passing, and wondering what your thoughts are. Beautiful post. The one silver lining I can see is that the door has opened a little wider toward conversations concerning mental illness. Thanks for your courage and being you. Appreciate you reading and commenting. Be well. I too am a suicide survivor. Just before I hit puberty my mother’s Gestapo tactics went too far. I was completely out of energy to fight her off anymore. I attempted suicide. My mother was taking some sort of pills called Cope, and coping was not something I could do any longer. So I swallowed all the pills one day in the school bathroom where I was alone. That’s where they found me: passed out on the floor in a bathroom stall. Although this appears to have been premeditated, it wasn’t. I just woke up that morning, empty of this world. I had no feelings, no fear, and I never questioned that I wouldn’t carry this out. From the moment I took the bottle of pills out of the medicine cabinet, I no longer had a connection to this world. It was like I was already gone. It’s interesting to describe how I felt when I didn’t feel anything at all. All I remember is waking up in the hospital. The first thing I saw and heard was my dad holding my mom back from swinging at me as she yelled out over and over again that it wasn’t her fault. She was crazed with anger and rage. Dad had his hands full, and it was all he could do to hang onto her to keep her from hitting me. I had taken another shot at escaping this life only to find myself right back where I left off. Again, my lesson was to not run from any of this. Just keep walking through it. In my life I’ve always been guided by my “Spirit Guides.” Without “them” I know I wouldn’t have made it. At the same time because of “them” I know there’s much more than what’s here in this life. I thank you and your Guides for being here, Linda. Leave a comment for: "Be Glad Others Don’t Understand"